I have created CSV files in flow but you run into limits when there are large datasets. In fact, doing anything with large datasets involves moving large JSON payloads from one step to another. Thanks – that’s good to know. What are the limits, roughly? Very useful, thanks! I still have a lot to learn about Flow. The list of gateways shows up, but that doesn’t mean you can actually connect to anything… But why do you need to connect to BigQuery in Flow? Why not do this directly in Power BI? It’s a start but needs to build out more of the connectors available in PBI. I was looking forward to using to convert Excel (on Azure Blob Storage) to JSON/CSV and ingest in SQL with ADF. Can’t seem to get it to open an Excel file from OneDrive, SharePoint Site, or local thru a gateway. It’s exciting they are moving it into Flow, but seems pretty limited at initial launch. I’m really looking forward to this when I can do it the other way around. Pull Excel or CSV files from a OneDrive/Sharepoint folder, ingest them and land them in SQL Azure. That will open up some serious options for us. Ken, I’ve done this quite a bit in Flow. I read Excel files from Sharepoint. A few things to keep in mind, writing to Excel is row-by-row so get ready for Flow runs for about 5 minutes to write 250 records. I can’t remember if that holds for reading. Hopefully, they will enhance the Excel querying/writing to be batch oritented. CSV doesn’t have that issue but then Excel is forgiving when it comes to columns being added or moved around. Also, if the file is dropped on Sharepoint then it is locked for 10 minutes by Sharepoint so trying to remove or overwrite it won’t work. I had to put in a delay. Finally, the Excel connector hard codes the file path and name at design time and if the files is overwritten then the GUID for the file changes and Flow doesn’t work. Despite all the headaches I still love Microsoft Flow. The Excel connector is so being improved so I’m thinking it’s just a matter of time when all this gets ironed out. It’s just frustrating in the interim. It’s quite interesting how he overcomes some of the limitations you mention. I’m not a developer and am trying in this precise moment to build something for myself. 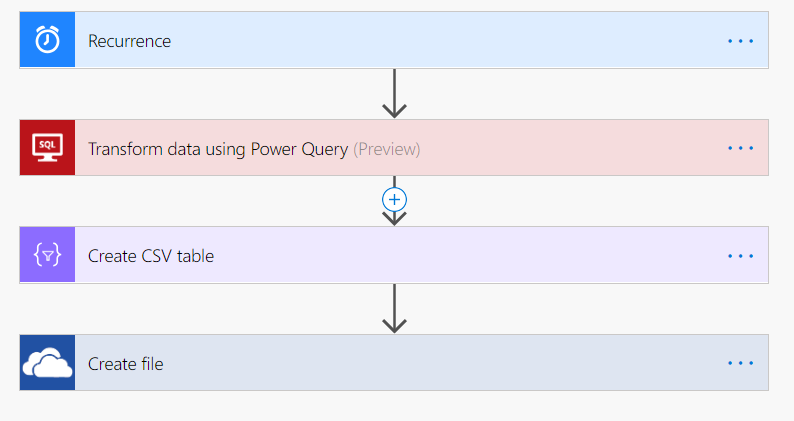 Also would really like to know how to pull csv to sql azure through flow. Hey Chris, did you have issues with having to add IP addresses multiple times to you’re azure firewall settings? I did have some strange problems at first but I don’t know the cause and they stopped after a few minutes. I don’t think they were firewall related though. 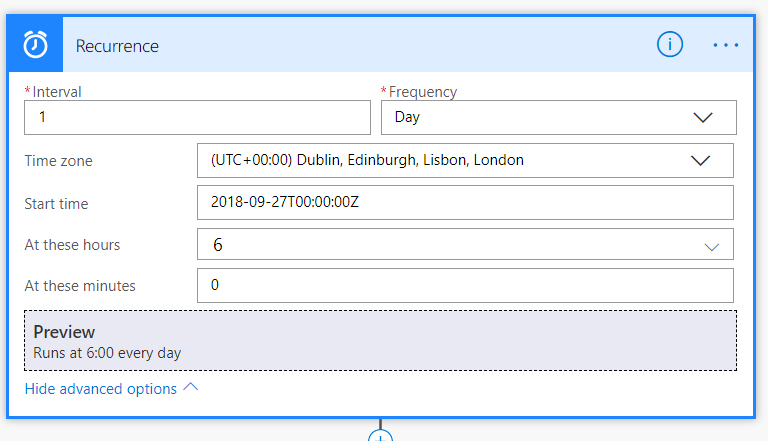 I followed your example but in the step ‘create CSV Table’ , in the ‘From’ field I get ‘BODY’ instead of ‘VALUE’ to select … and this does not seem to work further… Any idea what the reason can be ? I have got this working – but what is really needed is the ability to pass in a parameter – I managed to add a parameter by clicking on the Parameters “folder”, then using get data to add a “dataset” and then changed the code to use the same pattern as the Server or Database. I put a default value in and it worked in the query, by amending the code to reference the parameter in the normal way (#”paramname”). However I cant find any way to pass in the parameter from the main flow. This is needed as the real value here is in being able to get hold of data for a specific user / client / invoice or whatever and then use that data to say build an email using the HTML table. Any ideas – can your contacts help – if you work it out could be the good subject of a blog post! not sure if I get your request right, but how about storing your “paramname” in a file that you import into PQ as well and reference it there? Thanks Imke, I have thought of that as a workaround, but it seems a bit clunky.